Established in 1977, we are a family owned and operated HVAC contractor, located in Eudora, KS. 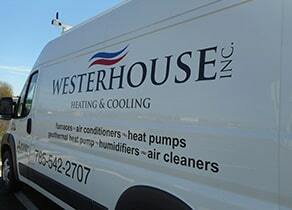 Westerhouse Heating and Cooling specializes in residential and light commercial heating systems and cooling systems. We offer a wide variety of HVAC services such as servicing and HVAC installations. We also specialize in HVAC maintenance. Whether it’s your heating or cooling system, we have you covered. Westerhouse Heating and Cooling in Eudora, KS offers HVAC products of some of the leading brands. With us, you will find gas furnaces and heat pumps in different sizes to suit your needs. As a member of the small business community, we pride ourselves on delivering the best customer service for our heating and cooling customers that we can. We focus on hiring and keeping the best team members, being on time and repairing and installing your furnace and air conditioner with expertise and for a price that is fair. Mike Westerhouse and his sons own and operate this Westerhouse Heating and Cooling because they love what they do. They appreciate being a part of a community and helping their neighbors. They prove this by being active in the community. Did you know they worked with the students in Eudora High School's Technical Trade Program? 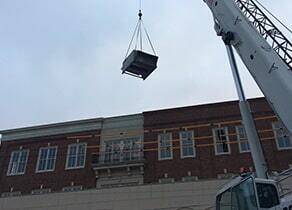 They donated the furnace and air conditioner as well as the duct work. The techs from Westerhouse worked alongside the students at a house they were building to teach the about HVAC installation. Learn more about the project here. They have the respect and trust of their customers for a reason: they've earned it by doing the right thing at the right time- every time. Shopping local is vital to Westerhouse Heating and Cooling. If it's important to you, remember us when you need a furnace and air conditioning repair (HVAC Repair), service or new equipment installation. If you are not a current customer, we'd like the chance to prove ourselves to you. We serve Eudora, De Soto, Johnson County, Lawrence, and many surrounding areas. Westerhouse is the number one provider for heating and cooling services in Eudora, De Soto, and Lawrence, KS. We are a small multi-generation, family owned Heating and Cooling company that repairs, services and sell/ install air conditioners, furnaces, heat pumps, geothermal systems, mini-splits (single room HVAC), and air quality systems. We also specialize in the maintenance of your heating and cooling systems. Maintaining your furnace and AC will result in a more efficient system saving you money on energy bills. Regular service also helps extend the life of your furnace and air conditioner. Call Westerhouse for a service appointment. We are an HVAC company offering installation, servicing and maintenance of heating and cooling systems. We are equipped to design and install residential and light commercial HVAC solutions tailored to your unique building. Our company also offers HVAC products of different brands and types. We are licensed to serve Eudora, Lawrence and surrounding areas in Kansas. Our company also provides emergency services 24 hours a day, 7 days a week. They were friendly and knowledgeable, provided the best product for our money. Thanks! Excellent communication. Competitive prices and friendly/knowledgeable employees. Thank You! Our blower died about 4 am June 11, by 7 am-ish I had a returned call. By 9:30 the gent was here diagnosing a bad blower and by 3:30 pm he was back to install a new and get us enjoying delicious cold air again!The best A/C and Heat service ever! Thanks again! Awesome service. Responded quickly and got the job done. Had me up and running before even one of the other companies returned calls. Still waiting for those callbacks in air-conditioned comfort. Yay Westerhouse! We did not have any heat so I set up a time with another company and they never showed or even called me back. I called Westerhouse in a panic and they showed up in 30 minutes and the Tech was fantastic! Thank you for your great customer service!! Something went wrong with my furnace this morning and we didn't have heat. My management company called Westerhouse (New Year's Day) and the tech was here in 20 minutes! He fixed it quickly and I still got to enjoy my day off... with heat! Thanks for the great Technician and super fast response time! Are you looking for a reliable HVAC contractor to install your air conditioner? Do you need to service your heating system? Then don't hesitate to rely on Westerhouse Heating and Cooling. Are you looking for a reliable heating and cooling contractor to install your furnace or air conditioner? Has it been too long since you have had service on your HVAC system? Then rely on Westerhouse Heating and Cooling. Are you looking for a reliable HVAC contractor to install your air conditioner? Do you need to service your heating system? Then rely on Westerhouse.